You can check the number of business cards that have been put into Sansan from the Tablet PC. Here we will show how to do this. 1. 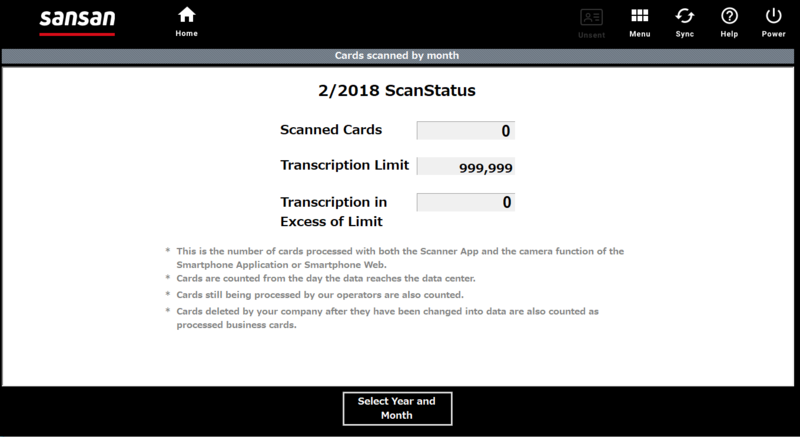 From "Menu" of the Scanner App, go to "Number of Scanned Cards"
It may take some minutes or even up to an hour for numbers to be reflected in the Number of card processed. If you are trying to make sure you do not exceed your limit, we recommend checking the number of cards processed before you start scanning. The number of cards that is used for billing can be checked from the Tablet PC (this function) or from your PC (Number of cards scanned). Please be aware that numbers shown on other screens may be different that the number used for billing. If you have multiple Tablet PCs, the total number of cards processed on all Tablets PCs will be displayed.